After an epic, month-long battle that could not be won, the last Spartan has left Halo 2. Microsoft announced in early February that it was dropping online support for original Xbox consoles and games, a decision which, given the system's age, appeared on the surface to be of little consequence. But nobody stopped to think about the Halo 2 fans who still played online and who decided to use the shutdown as an opportunity to show the world what "die hard" really means. The plug was pulled on April 15 but a handful of players defied the inevitable by refusing to disconnect. They just kept on playing. A week after the service went dark, there were at least 24 players left; by May 3, their numbers had been whittled down to five and even Microsoft, the purported villain of the piece, was rooting for them. Alas, all good things must come to an end. As of yesterday, only two Spartans remained standing: Agent Windex and Apache N4SIR. Then, at 7:21 EDT, Agent Windex delivered the news. "I just got kicked off guys," he wrote on Bungie's Halo 2 forum. "Good job Apache, you're the last one." Apache continued to play the game alone ("I drive the Warty off some mad hills and jumps!") 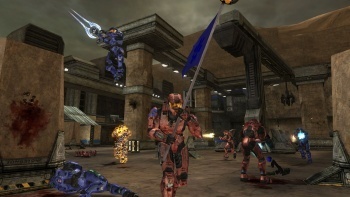 until he too was "forcefully removed" from the Halo 2 servers at 1:58 EST on May 11. "I want to thank the whole Bungie team for an awesome ongoing series and what seems to be a great Reach game," he wrote in a "salute" to the game. He said disagreed with Microsoft's decision to end support for the game but thanked it anyway for "publishing and supporting Bungie and the Halo games we truly love." Well played, ladies and gentlemen. Well played indeed.